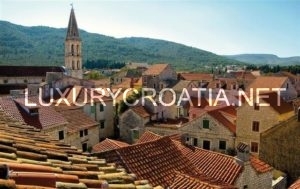 The island of Hvar is located in the Adriatic sea in the central part of Croatia’s Dalmatia. It is the fourth island by its size, also called the “sunny island” due to the many hours of sunshine in the year, almost 280. The local hoteliers take pride in this, so if it happens that it snows on Hvar, your stay there is for free, however, this is a bet you are sure to loose. Luckily, there is some rain that enabels the production of beautiful greens and nature, especially lavander, sage, rosemary, thyme and some vineyards. 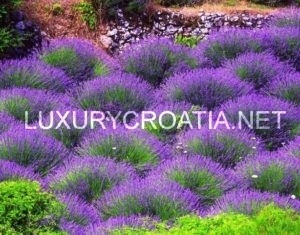 Lavander actually happens to be one of the symbols and main exports of the island, so make sure to explore this beautiful plant on Hvar. 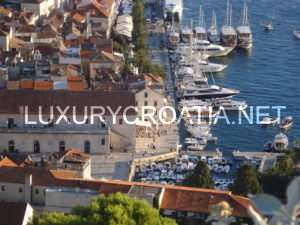 Some of the main resorts on Hvar island are the Hvar town, Jelsa, Stari Grad, Vrboska and Sucuraj. The busy Hvar town’s beauty is particulary recognized even amongst the rich and famous, accounting to the previous visits of stars such as Prince Harry or Jay-Z and Beyonce, so keep your eyes wide in a chance of bumping into some other celebrity. Hvar town is characterized by the beautiful Gothic palaces, marble streets and walls from the 13th century that surround it. There are many beaches on Hvar where you can just leave your towel and jump in the sea for a swim, but the nearby, small chain of islands, known as Pakleni Islands, hide crystal- clear waters, lagoons and beaches. Some of Pakleni islands are St. Clement, Palmizana, Jerolim, Stipanska and Marinkovac. However, most visitors come to Hvar because of its reputation as the best party town in Croatia. The easiest way to get to Hvar is by hoping on a catamaran that runs daily from Split to Hvar town, and you will be there in an hour or two, depending on the tour that the boat is taking. Split’s airport makes it easy to visit Hvar if you are coming with air traffic from other parts of Europe as well. If you are coming with a car, you can also come by a car ferry from Split to Stari Grad with Jadrolinija. There are other destinations from which you can get to Hvar besides Split, such as a catamaran running from Dubrovnik or by a ferry coming from Drvenik, so you shouldn’t have any problems with reaching this beautiful island. There is a boat service on Hvar, giving you a chance to go on an excursion trip to some of the nearby Pakleni islands, you just need to get on a taxi boat and you are there in no time. The Hvar town has a promenade in the harbor, nesting some small boats and some luxury yachts to create a nice atmosphere in the evening light for a walk around town. The sight that waits for you after the harbor is the St. Stephen’s Square, with a St. Stephen’s Cathedral and it’s bell tower at the end of the main town square, built in the 16th and the 17th century. Not so far away, there is Croatia’s first theatre to admire, being one of the first community theatres in Europe as well. 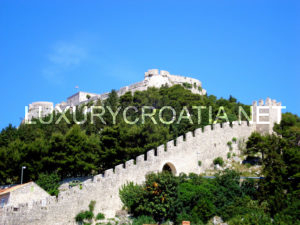 Above Hvar town, there is the Fortica- a fortress that was built in the 16th century that will give you some of the best views of Hvar and it’s sea surroundings. 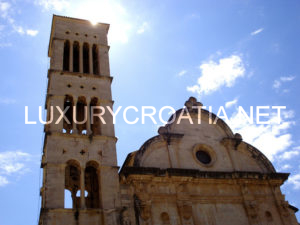 The main sight to see in Jelsa is the St. John’s church, dating back to the 15th century. 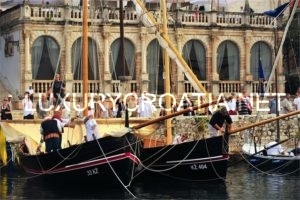 There is a procession going on the island where each of the six villages on Hvar sends out a group that proceeds through the other villages in a circle. Following the cross, how this procession is called, is due to the fact that it is led by a cross-bearer, walking barefoot or in socks and never resting. 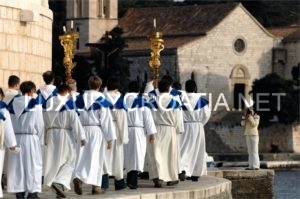 This is a long tradition and a part of Hvar’s religious identity that connects the communities of the island together, and it is listed on the Representative List of the Intangible Cultural Heritage of Humanity. Stari grad has sights to see as well, such as the tvrdalj building, bulit by the writer Petar Hektorovic, or the Church of St. John, with some parts dating back to the 6th century. The Stari Grad Plain on the island is a landscape that was set up in the 4th century BC by the ancient Greeks and is still used today, as it has kept most of it’s original form. The place is a unique and valuable example, showing us how the ancient Greeks used to nurture agriculture, and it is protected by UNESCO as Croatia’s 7th location on this list.There is good food to enjoy on Hvar as well, going from the tradition of Dalmatia’s fishing, producing some of the best sea food specialties, seasoned with home-made authentic olive-oil and complemented with a glass of some of the best vines, your palate will be satisfied for sure.